Trump won because he is racist. He won because he is sexist. He won because he is islamophobic. He won because he is homophobic. Our country is extremely sexist. And I know it will take a man tweeting this for it to really resonate. I’m sick and tired of it. I’m sick and tired of these uninformed jackholes telling me that I’m racist, sexist, Islamophobic and homophobic. They have no basis for those claims. They’re consumed by their emotions. Do they honestly believe Hillary Clinton lost solely because she’s a woman? It couldn’t possibly have anything with her being a pathological liar who’s spent her entire life pursuing political power? It had nothing to do with the fact that America’s not satisfied with her vision for America– an America with open borders, higher taxes and more bureaucratic scumbags in D.C. telling us how to run our lives? 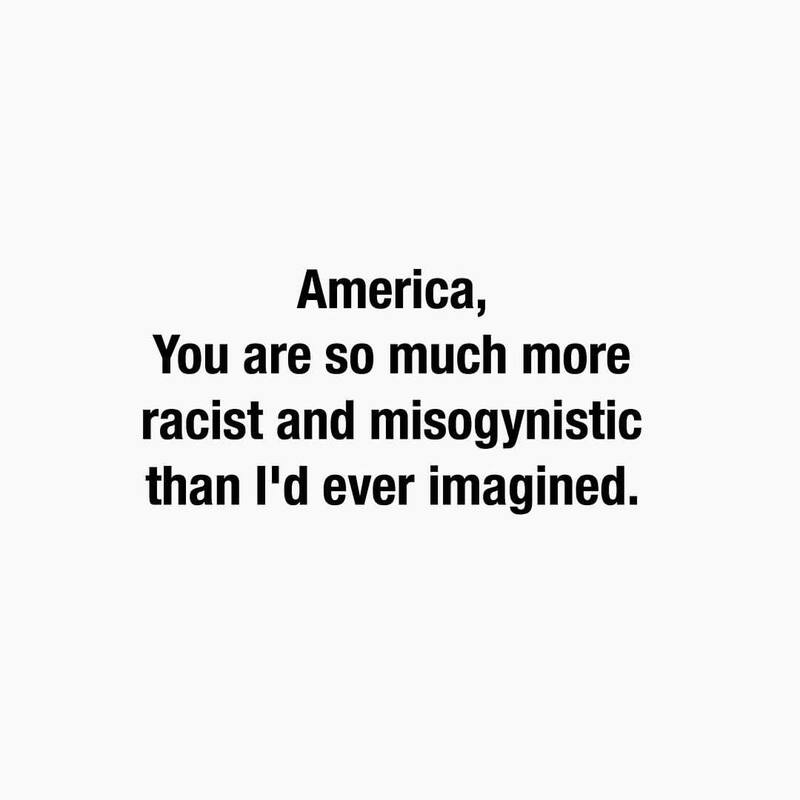 We’re not racist or sexist. We’re freaking SICK AND TIRED of the political establishment crapping all over the Constitution and treading on our liberty. We’re sick of them refusing to uphold the rule of law. We’re sick of being told that this is as good as it gets. We want economic freedom. We want to keep more of our hard-earned money. We want healthcare premiums that AREN’T AS MUCH AS OUR MORTGAGES. We want people to enter our country LEGALLY. We believe in peace through strength. Faith. Freedom. Family. We’re the most kick a** country that has ever existed. All you liberals whining over our “demise,” GET OVER YOURSELVES. You’re clueless. We were founded on the novel idea that we were endowed by our Creator with certain unalienable rights. Rights than cannot be given or taken away by a governing authority. This was about individual liberty. We reject government force and coercion. Votes. Favors. Political power. That’s the cycle of every progressive politician. We’re done. We’re sick of it.